Previously, "Endless Legend" was a term I used to describe the interminably long lore dumps associated with fantasy RPGs. Now it's also an upcoming 4X strategy game, created by Endless Space developer Amplitude Studios. Fittingly, they've created their own series of lore trailers, each introducing the game's roster of factions. Far from endless, though, they're relatively short. This first video, introducing The Vaulters, is just over a minute of phrases like "unknown relics," "hidden past," and "coming soon to Steam Early Access." Set on a planet in the Endless Space universe, Endless Legend also ties in with Amplitude's tower-defence roguelike Dungeon of the Endless . 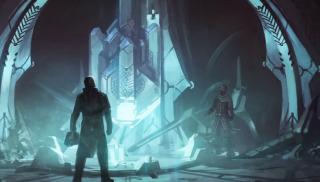 The Vaulters were previously a playable race in Endless Space and, according to a press release sent out by Amplitude, will be Endless Legend's most sci-fi faction. For more on the game, check out Tom's preview . Endless Legend is due out this Spring.